A slight feeling of despair may be a common reaction to one's first encounter with this diagram (Figure 24), which may appear to add the last straw to what is an already unbearably heavy weight of symbolism. But in actuality, anyone who can follow a subway map of New York City will have no problem with the Cube of Space. It is a sort of internal map of the Universe, given in the Sepher Yetzirah, where a direction is assigned to each letter of the Hebrew alphabet. Figure 22. Signs of the Zodiac on the Tree of Life. 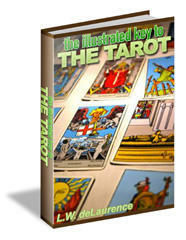 The Twelve Zodiacal Paths are the twelve simple letters of the Sepher Yetzirah. and one which may serve to demonstrate the extent to which Qabalistic symbols are meant to be used in our internal learning process. If we sit quietly, we may conceptualize our thoughts, feelings and spiritual being as controlled from a central point in our heads. Perhaps this could be called the "I" point. Once we have focused on this internal point, we can begin to think about how it relates to principles of an inner universe. These principles are the corners and directions of the cube. So what we do is to make believe that our consciousness is inside a cube, giving our intelligence something concrete, though artificial, with which to begin inner exploration. Figure 23. 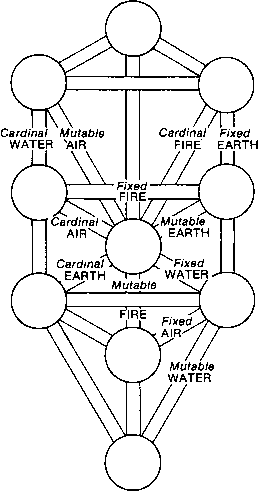 The Signs of the Zodiac on the Tree of Life as Cardinal, Fixed and Mutable Elements. The Cube of Space is simple enough, though it is a very different pattern of symbolism than is found on the Tree of Life. 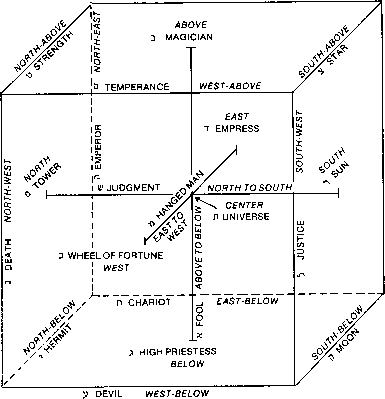 And, while the Sepher Yetzirah describes this Cube of Space very precisely, it is not so easily related to the Tree! The problem arises in that the document does not specifically ascribe to Paths between Sephiroth as is understood today. And, as we have seen, some versions of the Tree do not show a complete twenty-two Paths. Pythagoreans, popular in the second and third centuries A.D.93 The least that can be said is that (like the Bahir) there are aspects of the Sepher Yetzirah which are not easily accomodated into our modern symbolic structure. On the other hand, the Cube of Space demonstrates certain relationships not at all obvious on the Tree of Life. 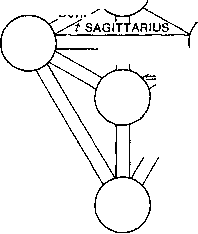 One primary example is the symbolic crossing of the three Maternals at the point of THE UNIVERSE (Tau). It is also more consistent with the directions of traditional ritual: East, West, North and South. Gareth Knight describes this as the "Upper Room,"94 a method of relating our mundane spatial perspectives to an inner experience, as a matter of orientation. It must, however, be stressed that none of the external systems truly indicate the quality of the inner experience of the Paths. The reason that they all appear so complex and disjointed is that they attempt to suggest experiences which our language is inadequate to describe. No matter how dogmatic one may be about the intellectual intermesh of symbols, the most intricate commentary on these matters is often like the medieval clerics who postulated the number of angels that would fit on the head of a pin. Yet some statements which appear to be symbolic turn out to be very precise descriptions of a universal experience. It is up to the discrimination of the student to decide which is which. Only the inner experience of these Paths make clear what the various systems of symbols are trying to explain. 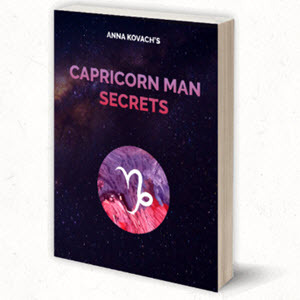 And until such time as we encounter directly the energies of the Tarot cards, we strive to form concepts about these energies through such artificial devices as the Tree of Life, and through such methods as the Qabalistic manipulation of numbers.